Michael has been itching to make some pasta, so I suggested he make this pasta salad recipe I found in the latest issue of Sunset Magazine. The flavor combinations really work in this recipe, but it definitely needed salt to bring those flavors out (the recipe doesn’t specify how much salt to add!!) I would definitely add about half a tablespoon of salt. Michael also thought that adding some pancetta would really help the recipe out. Cook pasta in a large pot of boiling water until tender, 9 to 12 minutes. Drain and rinse under cold water. Grill vegetables on grill by brushing with olive oil and sprinkle with salt and pepper. Whisk together the remaining olive oil, vinegar, salt and pepper in a small bowl. 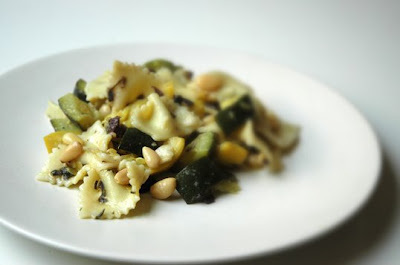 In a large bowl toss together pasta, vegetables, oregano, pine nuts, and olives. Add dressing and season with salt and pepper to taste. Enjoy! Our friend Mark made these delicious burgers yesterday. 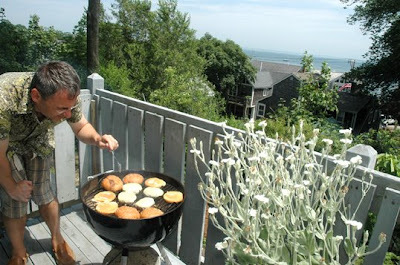 We’re vacationing in P-Town and instead of going out to lunch, Mark decided to make us some burgers. Mark says that it’s important to use 80% lean beef because burgers will otherwise dry out and be tough. Form the patties into eight equal size patties by lightly forming and rounding the edges. Wait until the charcoal has a uniform gray covering and grill burgers. Do not move burgers until the first side is correctly cooked. Patties are ready to flip when half of the patty appears cooked. Flip burgers and immediately place TWO slices of cheese on each patty. 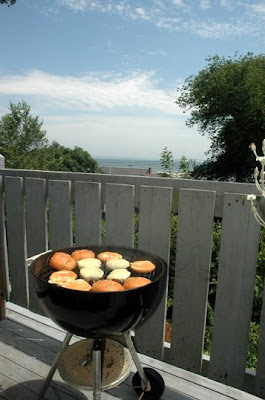 On the outside edges of the grill place and toast the burger buns. Make sure to rotate buns to prevent them from toasting unevenly. Buns are tastier when they have a medium brown coloring. Patties are done when cheese has melted and wrapped burger patty. Remove burgers from grill and rest for 1 minute. 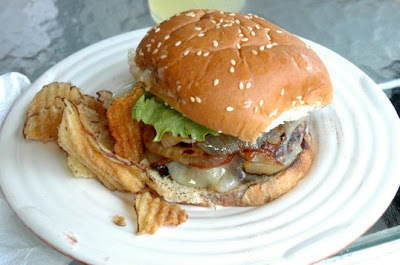 Prepare burgers by placing a patty on top of toasted bun. Add grilled onions and condiments to taste. Enjoy! This is a simple lunch recipe perfect for a hot summer day because it doesn’t involve much cooking. My mom always makes these during a hot Sunday afternoon! Poach chicken in chicken stock until cooked. Cool chicken and shred. Heat beans. Fry tortillas in vegetable oil until brown. 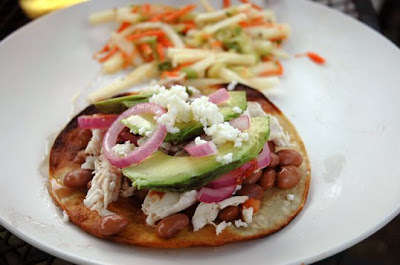 Take tostada, fill with beans, salsa, and chicken. Top with avocado, cheese, cilantro, and marinated onions. Enjoy!